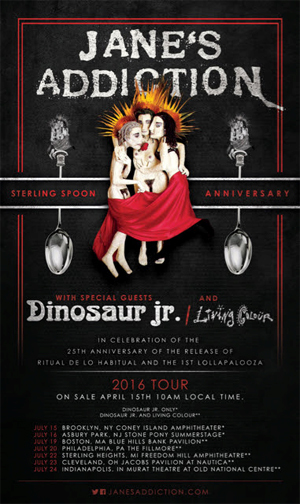 JANE'S ADDICTION will commemorate the 25th Anniversary of their album Ritual de lo Habitual with the Sterling Spoon Anniversary Tour, featuring DINOSAUR JR. and LIVING COLOUR on select dates. These concerts, which also serve as a tribute to the early years of Lollapalooza, will be part of an exclusive run leading up to JANE'S main stage performance at Lollapalooza's 25th Anniversary on July 30th in Chicago. The tour will kick off on July 15th in Brooklyn, NY as part of the opening of the new Coney Island Amphitheatre. The songs on Ritual de lo Habitual fully embrace JANE'S ADDICTION’s psychedelic and progressive side. Tracks like “Three Days” and “Then She Did…” exceed the eight-minute mark, becoming elegant aural tapestries with mystique a la LED ZEPPELIN. The album reached 3x-platinum in the US with two #1 singles including “Stop!” and “Been Caught Stealing”, the latter of which was nominated for a Grammy award for Best Rock Performance. For this tour, JANE'S ADDICTION will perform songs spanning their entire catalog, with a special nod to Ritual de lo Habitual within each show’s setlist. Tickets go on sale at 10 AM local time on Friday, April 15th through Ticketmaster.